It's puzzling how some people can look at a baby and say 'she looks like her dad' - computers have historically been even more limited. While a four-year-old can look at a cartoon of a chicken and say "That's a chicken", that sort of problem stumps computers. But next week at the IEEE Computer Vision and Pattern Recognition conference in Columbus, a University of Central Florida research team is going to show a facial recognition tool that is not only capable of matching pictures of parents and their children but can create accurate photos of missing children who will have aged. To hone in their algorithm, graduate student Afshin Dehfghan and colleagues started with over than 10,000 online images of celebrities, politicians and their children. "We wanted to see whether a machine could answer questions, such as 'Do children resemble their parents?' 'Do children resemble one parent more than another?' and 'What parts of the face are more genetically inspired?'" he said. Rather than engage in conjecture, the team believe they are advancing a new wave of computational science that uses the power of a mechanical "mind" to evaluate data completely objectively – without the clutter of subjective human emotions and biases. Facial recognition technology is already heavily used by law enforcement but it has not been developed to the point where it can identify the same characteristics in photos over time, something this technology could have the capability to do. Dehghan said he is planning to expand on the work in that area by studying how factors such as age and ethnicity affect the resemblance of facial features. This also touches on a hot topic since the heyday of science fiction - will computers be able to think? Instead of Isaac Asimov, Dehghan was inspired by the concept of Arnold Schwarzenegger's free-thinking robot in the movie "The Terminator ". He believes that computers can already emulating though, by using"deep think" by build on previous knowledge. While humans might look for something as prominent as actress Catherine Zeta Jones's smile in her offspring, the computer is able to focus on indicators people may not find as significant – such as the left eye, the chin and parts of the forehead. By designing an algorithm to focus on specific features, the research team converted the photos into a checkerboard of patches and extracted tiny snapshots of the most significant facial parts. The computer compared all the photos feature by feature and sorted them by the most probable match. The team found that its program not only did a better job of matching features of parents and their kids than random chance, but it also outperformed existing software for identifying relatives through photos by 3 to 10 percent. The study affirmed that children resemble their parents, often in unseen ways, but that in the majority of cases (63 percent) sons resemble their fathers more than their mothers, and daughters are more likely to resemble their mothers (82 percent). "Machines can learn through time," Dehghan said. "When a computer goes through thousands of images it knows what it has seen and is able to tell you." 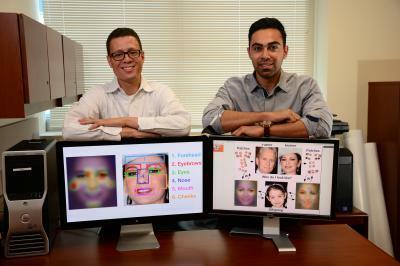 Technology has grown to the point that computer scientists are able to revisit findings from traditional science fields and expand on them, said Mubarak Shah, one of the world's leading authorities in the emerging field of computer vision and director of the UCF center. Shah, who advised Dehghan and his colleagues on the project, said the technology could also be useful in areas such as homeland security, where authorities can use the technology to determine relationships between terrorists.